My baby boy is coming for a visit in exactly ONE WEEK!! HOORAY!!! This youngest child of mine is the one that has oddest sense of humor and always keeps me laughing. He comes up with hilarious ‘off the cuff’ remarks that somehow seem to flow effortlessly and so quickly that I’m constantly wondering how he thinks up spontaneous retorts immediately. Daily I’m saying to him, “Joey, you’re a SILLY BOY!” He has been doing this for a couple of decades, beginning as the CLASS CLOWN in elementary school. 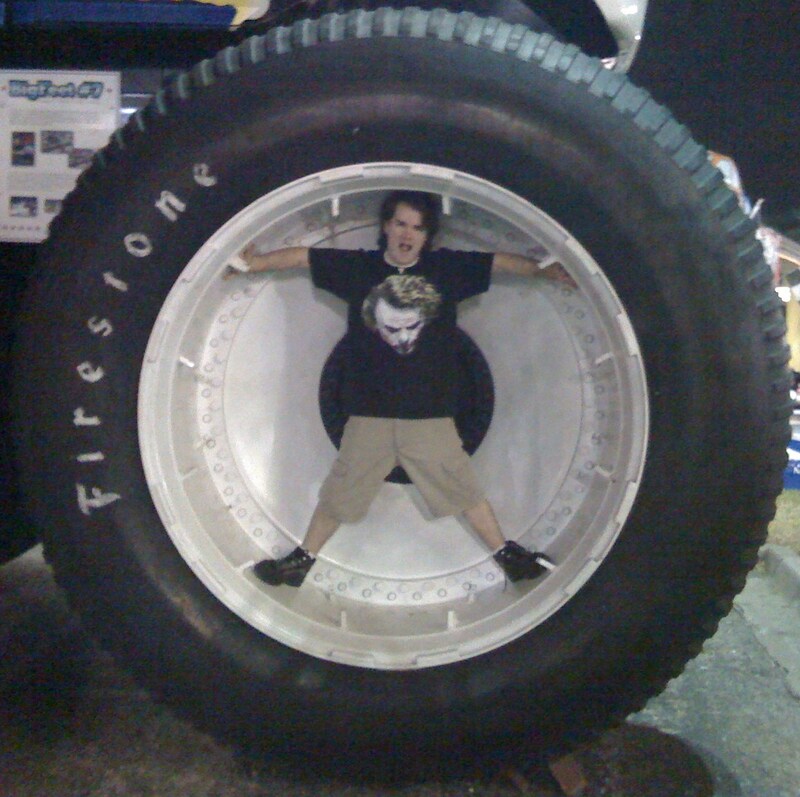 He’s never outgrown it so I reckon that it’s just a part of his personality. He’s well-liked wherever he goes, so maybe that’s the reason. I’ve not seen my baby boy in nearly 8 months this time. Or to be more ‘family correct’, I reckon I oughta say that my BABBY BOY is visiting. I don’t even remember when or why I started calling him that but the name has stuck. Just for me though. Nobody but his Mama calls him that, but then I suppose that mothers have cutesy names for each of their children (I surely do). Come to think of it, he’s had the most nick-names throughout the years out of the 3 of my kids. I honestly don’t think that there’s been any that he’s disliked. I often call him JoeRicky, which I think is a rather cute combo of his first & middle names that I’ve never heard anywhere else. He started out as JoeJoe as a baby and had that name for several years. I accidentally called him that, I don’t why it slipped outa my mouth, last year one time while we were with plenty of other folks. I was appalled, but he didn’t even flinch! I’ve never ever even heard him say “Mama, don’t call me that in front of my friends.” I certainly CAN remember asking my own mother NOT to do so at her many ‘pet names’ for me! Imagine my dismay when my mother came 4,350 miles from her small Hoosier home to visit me at college in Honolulu and managed to get my entire coed dormitory calling me ‘Jean Bean’! Oh, the horrors! But Joey has always liked his name. When he was young, he enjoyed the fact that his name meant the same as a baby kangaroo. I used to tease him that it was probably the reason that I had to carry him everywhere! That BABBY BOY wouldn’t walk till 3 months later than his brother and sister had. In retrospect, it was probably because I DID carry him so often that he didn’t feel the need to. With his sister less than a year older than him and his brother 2 years older than her, more often than not it was just much easier to grab the young’un and go! My family and friends have all heard me lament over the fact that it’s really very hard when the youngest child is the first to move far away. Well, it’s true nonetheless. He’s 29 and engaged to a young lady that he’s been dating for several years. But I still miss him tremendously just the same. A thousand miles from Mama is tooooo far indeed! I’m sure he’s looking forward to some of my chicken & noodles; that’s the meal that he always asks for first! We’ll go to some of the theme parks, of course. The beach is a definite MUST; everyone wants to go to the beaches. Joey usually likes to go to a beach on both coasts: the Atlantic and the Gulf of Mexico. That’s one of the positives of living in the middle of a long peninsular state. We’re a bit more than an hour from either coast plus we have passes to SeaWorld and Busch Gardens. Naturally we’ll go to DisneyWorld since those are free for us. He and his sister and a friend are wanting to go to Universal Studios annual ‘Halloween Horror Nights‘ but they can definitely leave this old Mama out of that one! I’m looking forward to taking photos. My other 2 children live here in this area within 5 miles so maybe I’ll get a few great group shots of ‘my little family’. But as for my SILLY BOY, as seen in the photo above….we just never know what kinda mischief he’ll get into when I get ready to take his picture! Another example: last year at Magic Kingdom, an instant before I was to snap his photo in front of Belle’s fireplace, he quickly curled himself up INTO Belle’s fireplace! Aaahhh, JoeJoe my BABBY BOY always likes to keep us guessing….and laughing….and smiling. He IS my SILLY BOY before, still, and probably always! I’m thinking that if somebody looks at this photo before reading this blog then there’s bound to be a bit of confusion. But nope….my 1ST LOVE was band! In this photo I was 12 and had no beaux to speak of, nor did I want any. I had my pals, the boys that I grew up with and played with since childhood and that was all right with me! I was a ‘late bloomer‘ when I started band. Most of my classmates that’d been interested in playing instruments had begun 2 years before. I started late and had a lot of catching up to do. I certainly did! This was probably the first time in my young life that I’d ever taken anything seriously enough to develop an extreme passion for it. I practiced and practiced and practiced, and I was GOOD! Luckily I had a band director that worked with me to give me lessons during that beginning summer on my own since I’d not had the ‘group lessons‘ that the rest of my classmates previously had. So I started out having to be in the 6th-grade band as an 8th-grader, that first fall when I had my original beginning band experience. It wasn’t fun being with the younger kids, plus my school itinerary was quite messed up in order to accommodate my classes so I practiced even more at home, 2-4 hours nightly (yes, I DID learn to drive particular family members crazy whenever I wanted to!) so that by the time spring term rolled around, I’d moved up to 7th-grade band. 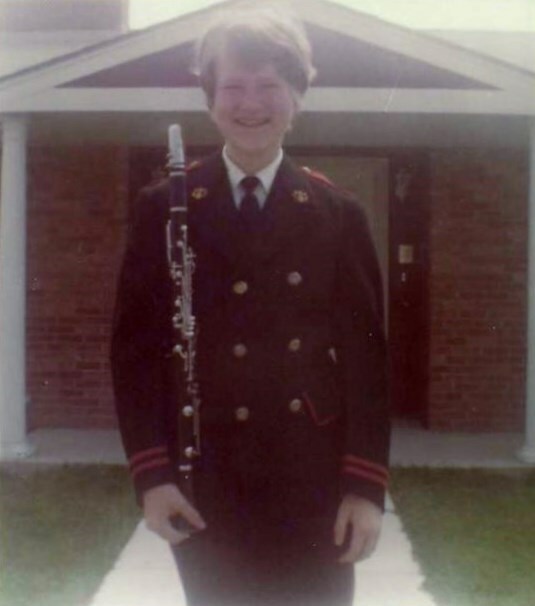 I skipped 8th-grade band altogether because I got more than caught up during the next summer vacation….so much so that when I began high school in the fall, I moved to the lead of ALL of the freshman clarinetists! Of course I was 1st-Chair Clarinetist as a Senior and had lots of solos, which I loved! This evening my daughter and I were watching a TV reality show and one of the given tasks was to learn to march. I found it humorous that the couples were having so much trouble doing so, even after several attempts. My daughter was surprised when I stood up and marched around the house, CORRECTLY, showing her that I still knew how to do every command and make every turn although I’d not done it for approximately 4 decades! She was quite impressed and even asked me to write my blog about my love of band! Awwww! In my high school we had marching band in the fall semester and concert band in the spring semester. I adored them both! Nowadays, I reckon I was then what was called a ‘Band Geek‘! I spent any and all free time in the band room. Band was my forte. I went to band camp every summer throughout high school at Purdue University. I was awarded the honor of being named to the McDonald’s All-American Band during my Senior year. Unfortunately, I turned down that honor because I was also invited to audition for the American Musical Ambassadors the same year. I chose to do that instead, and was surprised at the auditions to learn that several hundred invitations had been sent out to audition for each individual spot. I did manage to be one of the 2 representatives chosen for the state of Indiana so I got to make a grand European trip, playing 1 or 2 daily concerts EACH DAY in various cities all over Europe! It was the opportunity of a lifetime and I cherish those memories immensely! It was also my first time being away from home but I got a taste of what it was going to be like to go away to college when I returned from the trip. It was so very much fun selecting souvenirs from Europe for my parents and brothers and Gramma! My parents were usually the ones that’d traveled lots, and my brothers and I would always remind them to bring us something. It was a tremendous joy for me to be able to be the one to select the ‘treasures‘ and give them out for a change! Now my clarinets (I have 3) and my flute and my daughter’s oboe sit in my closet. It would presently cost a lot of money to get my main instrument ‘overhauled‘ in order to get it back into ‘playing condition‘, because it wasn’t a cheap clarinet. For my 16th Christmas, my parents bought me the best clarinet that money could buy, all the way from Paris! 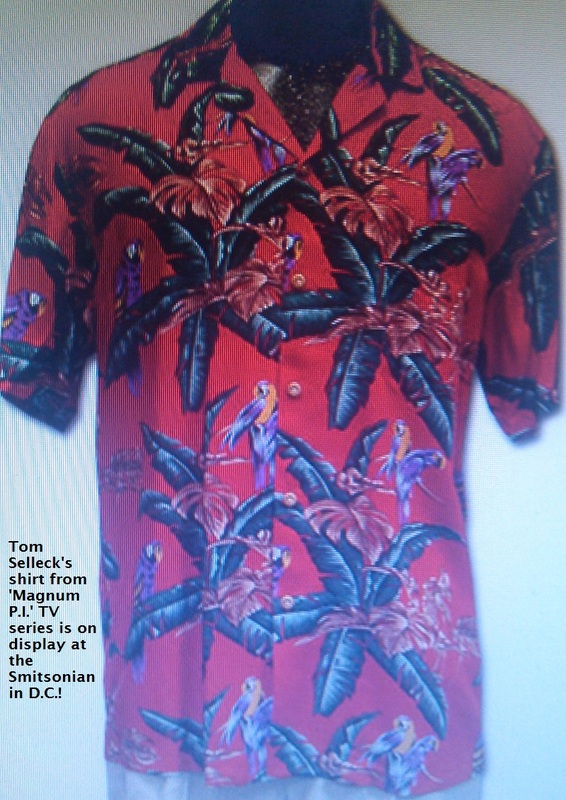 When I went to college in Hawaii and took private lessons from a member of the Honolulu Symphony, even my instructor was constantly trying to buy it from me. But I wouldn’t give up my 1ST LOVE!!! I’m just hoping that someday perhaps one of my grandbabies will love music as much as I did. Then my clarinet can possibly come back to life! Whenever I eat out at either Cracker Barrel or Long John Silver’s restaurants, I always remember to bring home a HUSH PUPPY! My daughter enjoys them. I used to like them too but I suppose my palate has changed over the years so instead of requesting that I not be served any, I’d rather bring a couple of these little cornmeal-balls home so that my daughter’s eyes will light up when I present them to her. I’m not really sure if I stopped eating them because of my health (surely there isn’t really anything nutritious about these deep-fried tidbits of cornmeal) or if it’s because my three kiddies liked them so much when they were young’uns that they ate them all before I got any! Either way, I don’t think that my tastebuds are missing much and I KNOW that I don’t need the calories, nor do my arteries need anything that’s deep-fried clogging them. The kids got their first pup when they were in elementary school in Indiana. They named her Aria. She was half-Corgi and half-Malamute. The dog’s papa was named Amadeus so the kids wanted a musical name to kinda match the papa, thus my youngest son chose the name Aria. We’d hoped that she’d get big like her papa but that wasn’t to be the case. She had big paws and a big head like her papa but short little legs and body like her Corgi mama. It’s probably a good thing that she didn’t get large because she would’ve cost me lots in dog food! As it was, she was a wonderful first pet for my children. She was an ‘outdoor dog‘ all the way. We lived next to the railroad tracks….it literally was in our side yard, so the kids had to train the dog to get used to the slower freight trains and the quick Amtrak train. It was so very cute watching my kids when they’d command her, saying “HUSH, PUPPY!” and then they’d start giggling because of their love for the FOOD of the same name. I’m surprised that they ever got that dog to quit barking at trains because I’m sure that the dog had to be very confused as to why these kids would say “HUSH PUPPY!” and then laugh. But eventually, all worked out. The kiddies had a couple of other pups throughout their childhood, after Aria, and they went through the same thing all over again. They enjoyed the humor, this old Mama just rolled her eyes! 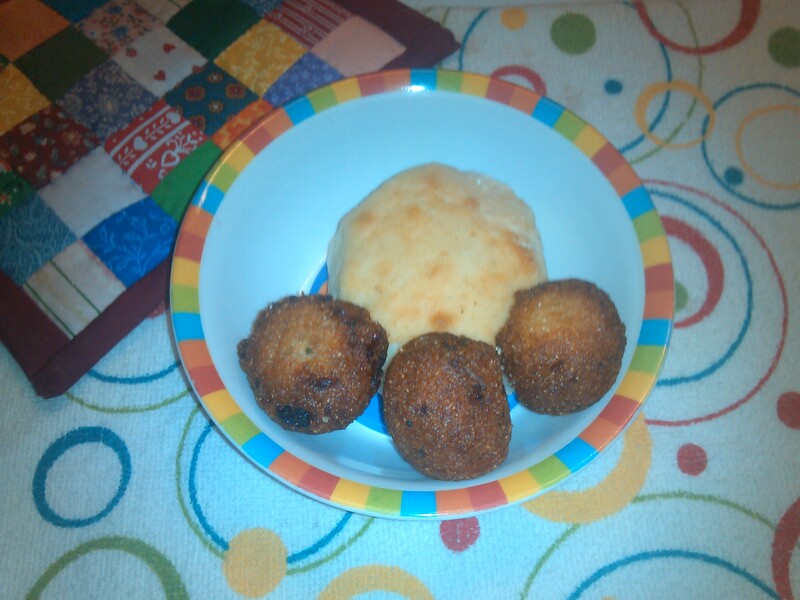 The photo above is from my leftovers from Cracker Barrel the other day, hush puppies and a biscuit. Still to this day, I cannot resist the urge to hand it to my daughter and say “Look what I brought you…HUSH PUPPY!” Yep, she still says “Ooh, thanks!” and has a grin on her face! That does make it worthwhile to bring home the leftovers! I find that it’s certainly true that we want the opposite of what we have. Myself, well, I have rather crazy hair that has never been stylish nor have I been able to tame it into whatever hairdo seemed to be popular at the current time. Nowadays I’m not particularly concerned with the way my hair looks, but according to the photo above this must have began at approximately age 3. 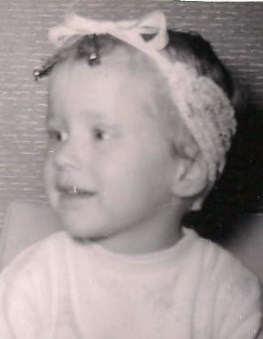 I’d imagine that my Mama was probably placating me at the time and I was probably excited to be GETTING PINCURLS just like Mommy had, but maybe this began several decades of unsuccessfully attempting to make my hair do things that it wasn’t meant to do! According to early photos, I had very straight hair as a preschooler! Mama was thrilled that I even had some hair because I had quite the lack of it as a baby. She and Daddy had curly hair so it made no sense to either of them that mine was straight. If only she’d have left it alone then I probably would’ve been very happy with long straight hair, as that was the norm in the 60s and 70s. But I blame my Mama for that early perm that she gave me because after that my hair would never go back to being straight again! Luckily it was very thick, so that was the only thing that I DID LIKE about my hair. I could not use a hair dryer because it would frizz terribly; in fact, a dryer hasn’t touched my hair in more than half-a-century! I took great care in cutting off tiny split-ends, as soon as I noticed them, little-by-little in such a way so as to not cut any of the length of my hair. I’ve had short hair, long hair, and shoulder-length hair throughout the years. In the Hoosier summer sunshine, I’d squeeze lemon juice onto my hair before sitting poolside after getting out of the backyard pool. Somebody had mentioned that this would keep away that greenish sheen that the chlorination from the pool’s chemicals would tint my hair. It must’ve worked because my hair didn’t have that ugly color. I remember when I wanted bangs or short ‘sideburns’ and having to wear the pink tape at night. The next morning I’d be happy with the reflection in the mirror from my temporarily-straight bangs….however, my disappointment would return along with my curls by the time I got to school! I just had no luck with straightening my hair. I thought that it was so unfair that I could not have the popular hairstyles! 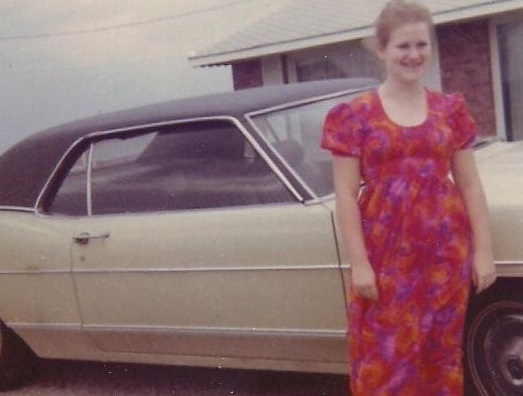 I got into very big trouble one Saturday afternoon when my Daddy came home early and walked in on me and a friend ironing my long hair on the ironing board, with a pillowcase between my hair and the iron. He sent my galpal home and I promptly got a paddling, even though I was already a teenager! My Mama has always put a lot of effort and emphasis into her hairdo and makeup. Whenever she went out the door of our house, she does so looking beautiful. I was of the generation that didn’t like makeup, and even though I experimented a bit, mostly I only wore makeup for special occasions or when Mama told me that I HAD TO! Anyway, Mama had a LOT of hair….verrryyy thick. She’s mostly kept it short, but has gone to the beautician to have it styled for as long as I can remember. When my brothers and I were young, we used to tease that we couldn’t even put a finger into her hair for fear that it’d get stuck! I am NOT kidding! Mama always knew everything that was happening too….we could never be sneaky and get away with things like we could with our Daddy or grandparents. Mama always told us that it was because that mothers have ‘eyes in the back of their heads‘ that children cannot see, but that we’d better believe that those secret eyes were there, nonetheless. Well, the night before Mama would have her weekly hair appointment, she’d give one of us kids a coin to brush out her hair. It took a long time since it was really thick plus had several layers of hairspray. Besides, she liked the feel of the scratching of the Avon brush upon her scalp. The oldest of my brothers almost always insisted upon doing this, and he performed the task ardently. It wasn’t until we were all grown up that he explained that he’d been looking for those ‘eyes in the back of Mama’s head‘ all those years and he never did find them! Tooooo funny! When I went away to college in Hawaii, I found that my long wavy strawberry-blonde hair was suddenly very popular, especially with the Pacific Islanders. Of course, I had to forget about the frizz because August in Hawaii is a bit humid and I just got used to it anyway. But I soon found that the Polynesian boys would hurry to sit beside me in classes. After a couple of weeks of feeling like a Midwestern Oddball, my Indonesian and Samoan roomies told me that the guys hadn’t seen red hair before! Several times I’d catch someone touching my hair just to see if they were gonna get burned! I even got mad at a boy from Palau that cut a long strand of my hair without my permission; when I turned around and glared at him, his excuse was that he wanted to send it home to his grandmother because she’d never believe it! I didn’t know whether to laugh or smack his face! In my mind I was having these thoughts of a little voodoo doll of myself in a dark room someplace awaiting these strands of golden hair but I remembered that these were South Pacific Islanders and not Creoles. Instead I told them that they could’ve asked and I’d have given them some strands from my hairbrush. About that time I started wearing my hair in elaborate braids and buns in order to avoid and solve these situations. It didn’t take too many months for the warm Hawaiian sun to bleach the red outa my hair anyway. As my skin darkened into a golden brown, my hair lightened and lost the red. I looked like any beachgoing blonde! Now I’m in my late 50s and my hair is totally white in the front. The back part is whitening. My hair is partially curly and partially straight. It cannot make up it’s mind. It’s nothing at all like when I was younger. The straight portion is as I had always hoped and envisioned but then there are these unruly curls that pop up here and there all over the place. They’re curlier than ever before. The curly-hair gene must have totally skipped my daughter. I’d always imagined that my daughter would have thick, blonde, curly hair. Well, it’s blonde, Period. Not thick. Not a tiny bit of curl or wave in sight. But she’s as blonde as can be. She got a perm once when she was a little girl and it was a mess to keep up with so we never did that again! She prefers a long ponytail and it suits her. Since my hair doesn’t do anything worthy of a style, I’ve been keeping it kinda short for the last few years. So I don’t think that either one of us will be GETTING PINCURLS anytime soon!! Maybe we’re finally accepting what we have. One of my younger cousins was grumbling about getting bruised from the trailer hitch on the back of her pickup truck early in the morning while in a rush to get her son to school on time. I think that’s something that most of us ‘country girls‘ have experienced at one time or another, unfortunately! YOWWEE! Add that to the scar on the inside shin from a motorcycle….plus knee scars from riding bikes & learning to do wheelies as kids plus elbow scars from getting thrown from horses! Aahhh….isn’t it great being a REAL country gal??? These all add up to a bunch of what I call my COUNTRY SCARS and, truthfully, I wouldn’t trade my upbringing, scars & all! I certainly had more than my share of scars and scabs during my ‘growing up‘ years. Much to my Mama’s dismay, I picked at them relentlessly. My Mama warned me time after time after time not to do so but did I heed her well-meaning warnings? I did not! And I had plenty of ugly scars as proof. They were reminders of my disobedience. Back in the 60s, whenever I’d open up a scab so that it’d start bleeding….I’d try to hide it! Because as soon as my Mama saw it then I knew that she was gonna get out that bottle of alcohol and that really really REALLY stung like crazy and I hollered and cried so much that Daddy often had to hold me down until Mama got everything cleaned and bandaged. Of course I thought that she was trying to punish me (well, perhaps somewhat). But I’m not a child anymore and I understand the necessity of cleanliness in order to avoid infection and healing. Nowadays there are multiple cleansers and ointments so that the bandaging process is nearly painless. Plus all the cutesy bandages made my own 3 kiddies come running for kisses and Band-Aids when I couldn’t even find any wound after clearing away dirt and debris! 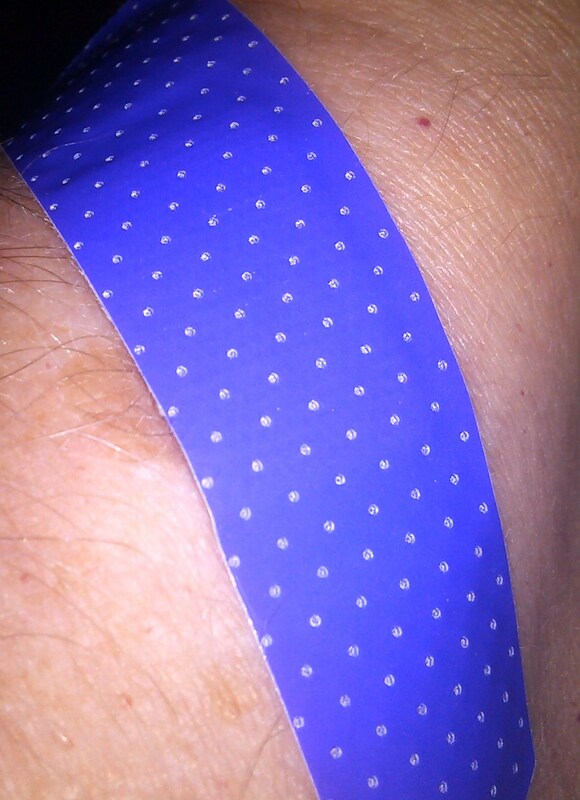 I still buy the adorable bandages when they’re on sale even though I know that I’ll be the one using them, even if it’s only for the instances that the bleeding won’t stop after taking my daily blood-sugar reading! So I have colored bandages, animal-printed bandages, Disney bandages, and whatever else may be in my ‘Band-Aid tin‘. I may not be getting any more COUNTRY SCARS but I’d much rather have those than the type that I get nowadays: surgery scars, scars from having too many blood draws, and scars from multiple falls! If only I could turn back that clock to my awesome childhood!!! I was surprised that many of the recipes actually came from several of my northern friends! Some even came from pals overseas! And you had better believe that most of my followers that commented were extremely adamant about their LOVE of SHRIMP & GRITS! I had no idea that I’d started such a ruckus. Yes, I did indeed try many of the recipes. 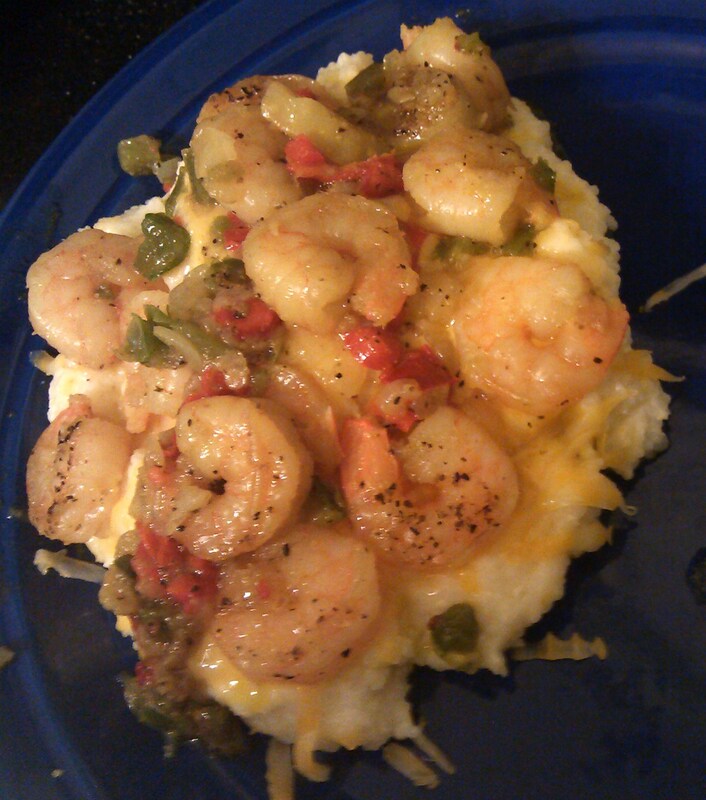 This photo is of the SHRIMP & GRITS that were my supper tonight. 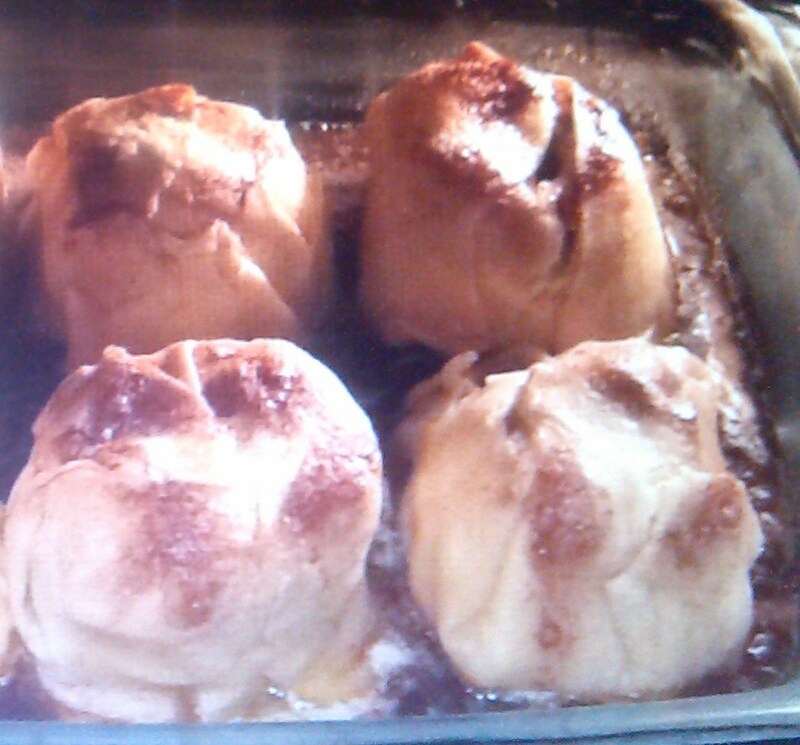 Yep….I’ve tried everybody’s recipes. I still don’t have a particular fondness for them and would prefer them separately! But I was gonna have Shrimp tonight anyway and my daughter was hungry for Grits so I figured that I may as well make up my own recipe and write about it!